1.Begin by assembling your front panel. Take both of you front flap pieces. NOTE: if you wish to line the front flaps this is the time to visit the upgrades post. 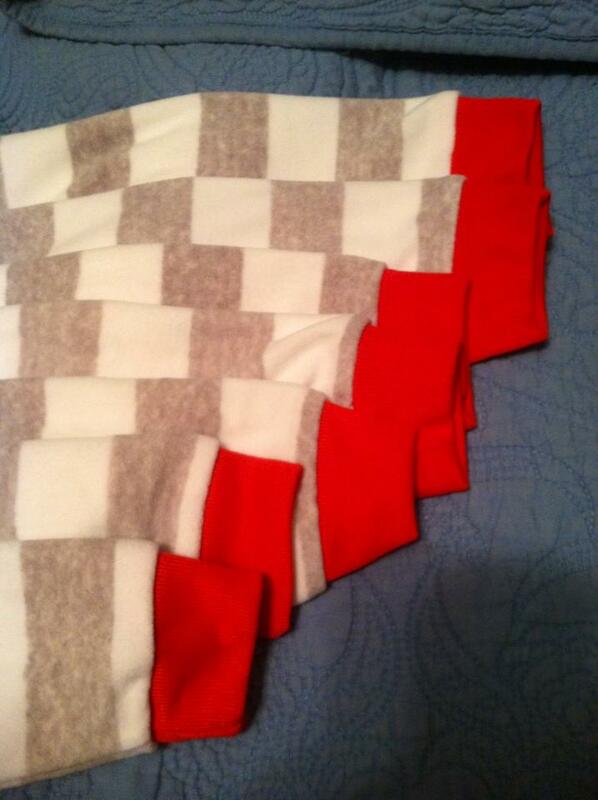 Align the two flaps on top of each other , right sides of fabric together. Sew a one inch wide seam from the top of the flaps down the center, about 9″ down, i don’t measure. Open the flaps so they lay as your full front panel, press open the seam you just sewed. Now press a 1/2 inch rolled hem the entire length of the front center edges. Sew the hem. Finished front flap seam and hem, this extends the entire length of the front opening. Front Panel assembled.This is the front panel sewn together with the front opening hemmed. Ignore the printed fabric, that is the front flap lining upgrade. If you wish to add that to your teepee. Here are the upgrade instructions. Mistakes, if you look closely you can see my iron rusted on my perfect new white front panel. Get over it! Move on! Have Fun! 2. Sew peak to each of the main panels. Sew one peak piece to the top of each main panel. Place fabrics right sides together, pin, sew 5/8 inch seam. Fold the peak up to create your full panel. Press the seam flat. press all layers of fabric to the top. Now topstitch across the seam through all layers of fabric on the peak side of the seam. Reinforcement, reinforcement, reinforcement when you are sewing for child’s play!!!! I like to use a zigzag stitch, it enhances the TeePee feel. A straight stitch will be just as sturdy if you prefer. Good enough is good enough. this is my “mis” alignment of the tee-pee peak and bottom panel for my front panel. i added more additional width for my center seam than was necessary. When you run into these “snags” just guestitmate your alignment and trim the extra off. It will be perfectly lovely. (or do a more accurate job with the original measuring than i did) This is not rocket science, it is fun creating. My 4 assembled panels. notice i still have not trimmed my excess on the front panel. You won’t get to see the finished product until Papa gets to California. We are making this TeePee for our Cali Babies, papa needs to find dowels out here. It is going to be so adorable. 3. Hem the top edge of each panel. Press a 1/2 inch rolled hem across the top of each panel and stitch across the top to create a finished edge. ZigZag or straight stitch, it is your design choice. Hem top edge of each panel. A rolled hem is simple. Fold the fabric down 1/2 inch and press, fold again and press, sew through all thicknesses of fabric. Now it is getting fun because your fabric mess is about to start to look like a TeePee. NOTE: If you wish to add the window to the back panel, now is the time. Window Upgrade. 4. Sew the 4 side seams. With your 4 panels laid out as pictured above (if you have added the window be certain your window panel is across from the front panel) flip one panel on to the panel next to it. Right sides together, align and pin one of the angled side seams. Sew a 1/2 inch seam down the entire length of the side seam. on the back side press all of the 1/2 inch seam to one side of the seam, also….check out those Nama hands….i really am old enough to be a Nama…mind blown! ZigZag through all layers from the front side of TeePee. Reinforcement is HUGE !! This image shows your peak seam reinforcement, your top hem and the side seam reinforced. Continue working around the TeePee, completing the final three seams as you just did this first one. This shows you all but my front flap panel assembled. i broke my own rule (Shocker!!) and put our window in after assembling the tee-pee. do as i say not as i did. Waaa-Laaa….you have something that looks like a basic TeePee. Adorable TeePee model not included. You will sew a pocket for the poles at each of the four main seams that connect your main panels to each other. Lay the TeePee with one of the side seams facing up, you will notice that the bottom of the TeePee forms a peak at the point of the seam. i prefer to sew a small hem to create a straight edge where you will sew your pole pocket. Fold the peak up to the inside of the TeePee, i fold up about a 6″ width, 3 inches on either side of the seam. Press and sew across the hem. The height of the hem at the center seam will be about 1.5 inches, tapering to nothing at the ends. Once you have hemmed the the edge at each seam, Lay your pole on top of the side seam. Fold the TeePee over the pole to create a casing for the pole to slide into. Pin the two sides of fabric together to create a loose fit around the pole. Remove the pole and sew the seam where you pinned the correct width. the seam will be somewhere between 1″-2″ inches wide, depending on the diameter of your TeePee poles. Hem Note: i cut my main panel pieces so the bottom of each side panel is along the finished factory edge (salvage) of the fabric. See Tutorial Part 1. When you can do this, you do not need to hem the entire bottom edge of the TeePee. If you have cut edges on the bottom of your main panels you will need to sew a 1/2 inch rolled hem along the entire bottom edge of your TeePee to prevent the fabric from fraying. POLES There are unlimited options for your poles, be creative and find something that will work for you. We like to buy wooden dowels from Menards or Home Depot. Menards in WI has a great selection in stock. We ordered online in Los Angeles and they were delivered free of charge to a local Home Depot Store. We have used 5/8″, 1″ and 1 1/4″ diameter dowels. The 1″ seems to be ideal. Buy 4 1″ dowels, 72″ long. Place rubber tips on one end of each cut dowel. Your simple basic Teepee is complete!! Slide your poles into each of the 4 pole pockets, make certain your rubber feet are at the bottom of your Teepee, you have a heap of fun about to happen!! Upgrade #3 Drill holes in poles and add ties at top of TeePee. Please Facebook me questions or suggestions so i can improve my tutorial. i would love to walk you through the process. You may also leave questions in the comment section. i was up at 4am doing laundry, suitcases are everywhere, piles are a mile high. Adrenaline is high, excitement electric, this is the day we have been waiting for. Final preparation and one last night of rest in our beds. I board a 2pm flight tomorrow to meet Travis and Melissa on their journey to their baby girl. Tim and Blessing board an 8pm flight to spend 9 days in Dallas with our Fischer Family. Tim’s mom has not been well. Tim needs to go, please pray. It is tempting to believe we are a breath away from the finish line in this journey. The next weeks will hold so much more than we can imagine or anticipate. There is much that is unknown and uncertain. One sweet first mamma will say the hardest good-bye she has ever had to say. And this after she has labored and delivered or been through major surgery. Lifetime Mamma and Daddy will wait in prayerful faith that the process will be completed as they ache for it to be. We wait for them to be granted the privilege of nurturing one tiny girl into the truth and hope of HIS Love. All this as their hearts break for the birth mamma who is trusting her most precious treasure to them. Two precious toddlers, with ear infections and pink eye will leave their security and familiar, entering a whirlwind of crazy change and unfamiliar. It is not easy to leave My Man and our girls. My Man would prefer to have me in Texas as we walk this season with our Fischer Family. My Man would prefer to have Me with Blessing at this time. Blessing would prefer to be with Mamma. I would prefer to be SUPERNAMA and be everywhere, managing all things. Emotions will be high, exhaustion will dominate. We have no doubts, we know we are each headed in the directions we need to be going.We feel beyond blessed to be allowed to join in these journeys with those we love most. The Baby we Celebrate in this season, Our Saviour, will be right in the midst of it all orchestrating every single detail. That all will see Calvary and the Love that was sent in this Christmas season through every single detail of the weeks to come for the Fischer Family. When i opened this devo today and read John Piper’s words there was a sweet calm assurance…all we need to know is that our Lord and Saviour holds each tiny detail in His loving hands. Now you would think that if God so rules the world as to use an empire-wide census to bring Mary and Joseph to Bethlehem, he surely could have seen to it that a room was available in the inn. Yes, he could have. And Jesus could have been born into a wealthy family. He could have turned stone into bread in the wilderness. He could have called 10,000 angels to his aid in Gethsemane. He could have come down from the cross and saved himself. The question is not what God could do, but what he willed to do. God’s will was that though Christ was rich, yet for your sake he became poor. The “No Vacancy” signs over all the motels in Bethlehem were for your sake. “For your sake he became poor” (2 Corinthians 8:9). God rules all things — even motel capacities — for the sake of his children. The Calvary road begins with a “No Vacancy” sign in Bethlehem and ends with the spitting and scoffing of the cross in Jerusalem. We join him on the Calvary road and hear him say, “Remember the word that I said to you, ‘A servant is not greater than his master.’ If they persecuted me, they will persecute you” (John 15:20). 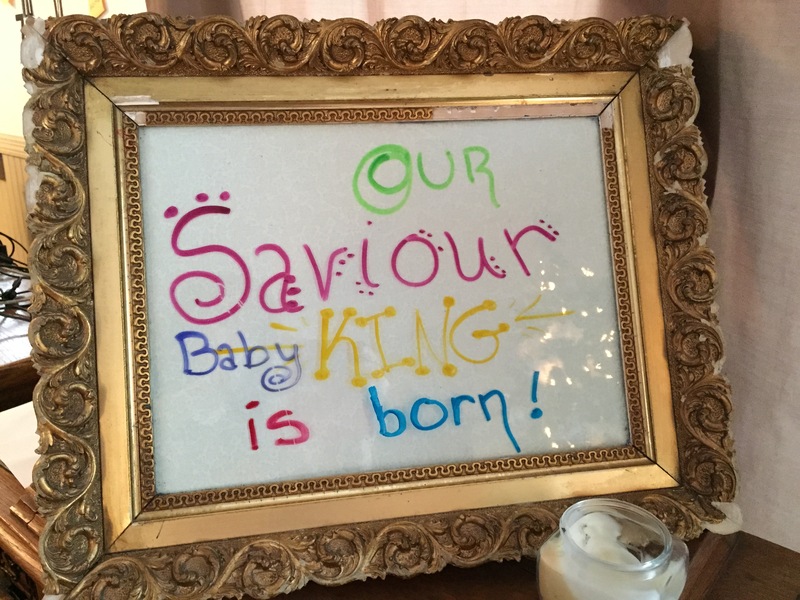 Yes, God could have seen to it that Jesus have a room at his birth. But that would have been a detour off the Calvary road. Do i trust HIS love, His plan and His power ? Do i desire, above all else, that every moment of my life will point other’s to the gift of the Manger, making the way for Calvary. My heart is full to exploding, i tend to pull inside and savor when all is well and busy and full, i am more apt to ramble when my heart and mind is busy sorting and figuring. Time will pass and the details of this miracle season in our home will be forgotten. Baby Coffee needs to know how amazing this season has been, our entire family needs to remember the God of this season. We need to share how blessed Nama and Pappa are to be on the outside looking in on His miraculous work of redemption. As we live the exciting count down to our 6th Grand-baby’s birth, her journey from our hearts to our arms, family and Travis and Melissa’s home i am going to take time to re-post much of Travis and Melissa’s writing about their journey to Baby Coffee Ice Cream. Bringing Baby Home…Which state is Nama Flying to? i had the privilege of just buying a one way plane ticket to travel to share the excitement of bringing our 6th Grandbaby home. I also bought 7 pair of Christmas Jammies because we will have a little tiny 6th Grandbaby joining our already 5 and Aunty Blessing by Christmas. For all of you following along on our adventure, this little one holds more secrets and surprises because of the very special way this tiny gift is coming to our family. Travis and Melissa are very thoughtfully sharing the details they feel free to share about their newest baby as they feel it is appropriate, they have decided that we get to know what state their little one will be coming home from. Happy Birthday to these two Fisch !!! !